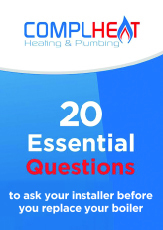 Complheat » Do I Need A New Boiler? Firstly, boiler usage can account for up to 55% of your annual energy bills – and the older your boiler is, the less efficient it can become. Did you know that you could lose as much as 40p in every pound that you spend on energy bills with an old boiler? That’s a lot of money you’re wasting and definitely a key reason to upgrade to a modern condensing boiler. Its not just the energy bills where your boiler may be losing you money. An older boiler generally means increased difficulty in sourcing replacement parts and they can become a struggle to service/ repair for gas engineers. Of course, we understand a new boiler isn’t cheap but investing in a good quality system means longevity and reliability to give you value for money. Many companies now provide finance and payment schemes to help ease the burden of a new boiler and make it easier to pay for. A new boiler will also be eco-friendlier and come with an efficiency rating. Modern condensing new boilers are generally 91-92% efficient. According to the Energy Saving Trust’s website, a condensing boiler has a larger heat exchanger, so it recovers more heat, sends cooler gases up the flue and is more efficient. Sometimes the flue gases get so cool that the water vapour in the gas condenses out, and even more energy is recovered from the condensing vapour. Boilers often come with a warranty and the gas engineering company usually provide a workmanship guarantee too. If your boiler is over the age of 15, both warranties and guarantees will have expired – meaning a repair becomes costlier than you may have first thought. If the boiler itself is relatively new but still showing symptoms of not working competently, it may have been poorly installed or not regularly serviced, which is why you may need a replacement. We suggest always knowing who installed your boiler and having their contact details handy. Unsure which company or engineer performed the install because it’s been so long? It’s worth having a new boiler installed with a trustworthy company who can ensure your appliance is fully tested and safe. In our vast experience, we’ve found that old boilers are often installed in inconvenient places that are quite often pivotal to home improvement projects and can be unsightly and, at worst, dangerous. Installing a new boiler allows you to move your boiler to a more practical space in your home, this may be more expensive during the install itself but will be more cost-effective in the long term. Overall, a new boiler will provide you with peace of mind and will be a lot safer to have in your family home – something you cannot put a price on. Complheat Heating & Plumbing can recommend more efficient and cost-effective replacement boilers that will last you for years, come fully guaranteed and will not cost the earth. We can also provide follow-up advice on care and maintenance, and perform annual servicing to ensure that your new boiler remains in prime condition.